DID SHE REALLY SAY WHAT I SAW HER SAY? Pity the Petaluma Adobe, the Rodney Dangerfield of local state parks; it don't get no respect. It was on the short list of parks slated to be closed in 2012 but even after a reprieve when the state discovered a hidden pile of cash intended for park operations, it's not clear whether it will remain open past June of 2014. Through its authentically boring displays, countless urban schoolchildren have learned all that they never needed to know about 1840s cattle farming and the life and times of General Mariano Vallejo, a man known for speeches so stultifyingly dull that he inspired the creation of the Squeedunks. To make matters worse, the venerable place is being slowly pecked to death by birds because the state stripped off the adobe plaster in the 1950s. Kids, there's your homework assignment: Describe what happens to a fragile historic property when decades pass without significant preservation efforts. Now let's get back on the schoolbus to visit Santa Rosa and the slightly later Carrillo Adobe, which has no preservation plan whatsoever and which the homeless are tearing apart for firewood. The Petaluma Adobe is what it is, and that's a glimpse at the agricultural side of California's Mexican past. Nothing of note happened on the property; General Vallejo himself was only there occasionally, and when he sold it to a farmer in 1857, even that ho-hum link to history ended. Come about a half century later, the section of the property with the old Adobe - "gradually falling into decay," as a 1910 Press Democrat editorial noted - was bought by the Petaluma branch of the Native Sons of the Golden West, a fraternal lodge open only to men born in California. For them, something very important had happened there indeed: The birth of the first American in the state. The next morning Governor Boggs' family were all moved over to the large adobe building on his Petaluma rancho, which was well stocked with horses, cattle and sheep. "Make yourself perfectly at home here," said General Vallejo, "kill all you want for beef and mutton, and ride all the horses you wish, and if there is anything more you need just let me know and you shall have it." Just the, or soon after, a wail and a cry from Mrs. William Boggs and general distress of the female portion of the family. A child had been born and apparently dying, if not already dead. As quick as a flash, General Vallejo drew his knife, jumped into the corral, and killing a young ram, stripped off its hide while still warm and wrapped that baby boy, who was apparently dead, up in it. Asking the parents if they had any objections to the child being baptized, they said, "No!" "What name will you give him?" he inquired. "Give him your name, General," they replied, and so that baby boy was baptized by the General and named Guadalupe Vallejo Boggs, when all declared he was dead. However, there was a spark of life remaining in him, and he revived, and the child had a second and miraculous birth from the spirit of God. The claim that the baby was the first American born in California is also silly, considering California was then still part of Mexico and the Mexican-American War wasn't quite over. It is more truthful to say that this was probably the last child of American immigrants born in Alta California, but that doesn't have quite the ring. But the Boggs' didn't need to photoshop their image to make themselves appear more interesting; theirs is a family whose trails criss-cross American history so often it is nearly unbelievable. 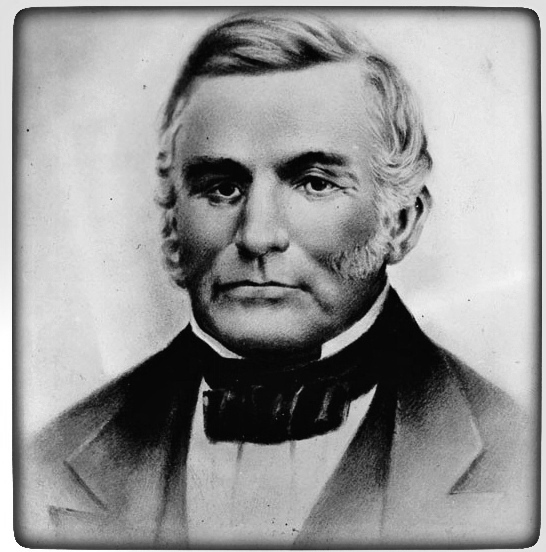 Patriarch Lilburn Boggs was governor of Missouri during the 1838 Mormon War, where confrontations between non-Mormon settlers and the growing population of Joseph Smith's followers led both sides to violence and vigilante terrorism. Boggs ended the conflict by declaring "Mormons must be treated as enemies" and ordering the estimated 10,000 Mormons in the state to abandon their property and get out, a directive so extreme that it outraged even Mormon opponents. Nearly four years later, an assassin came close to killing Boggs by shooting him the head while he was reading a newspaper at home. It was widely assumed that the gunman was the notorious Porter Rockwell, a personal friend of Joseph Smith who was called "the Destroying Angel of Mormondom," but he was acquitted at trial. Years later, son William wrote the family believed Joseph Smith had a death warrant out for him. Completely recovered from his gunshot wounds, Lilburn and his family joined a wagon train headed west. Lilburn soon was recognized as the leader and the group became known as "Boggs Company." As they reached the Continental Divide there was disagreement on how to proceed; Boggs' faction continued following the well-marked Oregon Trail, but some of the others opted to try another route said to be shorter; that faction called themselves the Donner Party. Lilburn's children became notable figures in their own right. His son, Thomas, spent part of his childhood with his uncle, Albert Boone (did I mention Lilburn's wife was Daniel Boone's granddaughter?) who was an Indian trader on the Missouri River. Tom Boggs learned several Indian languages and struck out on his own at age 16, where he worked in the Southwest for the Bent brothers, who were also his uncles. Tom and his wife formed an extended family with Mr. and Mrs. Kit Carson and when the famous frontiersman died, the Boggs' raised Carson's five orphaned children. His is another adventure story but it has little to do with Sonoma County; you can read a detailed (if flawed) biography here. William Boggs was also a kid when he joined older brother Tom and uncles in running their trading post on the Santa Fe trail, then returning to Missouri to marry and join his family in the famous wagon train. It was William, whose son was born at the Adobe, who apparently had the family's closest association with Vallejo (although the old general appeared in Judge Lilburn's court both as the accused and aggrieved). William was primarily a capitalist who made a good living buying and selling land. To promote local agriculture he and others incorporated a nursery to propagate and sell plant and seed, with Vallejo as VP and wine-making pioneer Agoston Haraszthy as President and nursery supervisor. William was also a neighbor of Haraszthy, and together they platted the vineyards for his Buena Vista winery. And that's just the well-known stuff. William also authored a book-length essay about his time with brother Thomas and their "life among the Indians," with an edited and abridged version appearing in the March, 1930 issue of The Colorado Magazine. Thanks to Google Books, I stumbled across a letter by William that states Vallejo betrayed Mexico and covertly aided the U.S. at a crucial juncture on the eve of the Mexican-American War. If true, this rewrites Vallejo's biography and history of the war. And finally, thanks to Bancroft, we know William wrote often for the Napa Register around 1872 concerning the war and the Bear Flag Revolt, suggesting there is likely still more to be found. Undoubtedly William M. Boggs deserves some serious attention from scholars. Any PhD candidates out there looking for a dissertation topic? If you still don't have your fill of the remarkable Boggs family there's grandson Francis, who was born in Santa Rosa and became a pioneer of another sort. He was a theatrical actor who became interested in directing some of those new motion pictures, directing about 200 shorts between 1907 and 1911. He directed L. Frank Baum's "Fairylogue and Radio-Plays," a pastiche made from several stories from the Oz books performed in a two-hour stage production that mixed live action with color film and slides. But Francis' most notable contribution to the history of movies was his opening in 1909 the first production studio in Los Angeles over the objections of his boss in Chicago. Within two years almost all of the big East Coast studios moved to LA as well. If not for Francis Boggs, there may not have been a Hollywood. In looking over the columns of the Examiner today I noticed an item headed "Old Fort Given to City," presumably to the City of Petaluma by J. A. Bliss of Washington, D. C., nephew of W. D. Bliss, formerly of Petaluma, a gentleman whom I remember well in the early history of Petaluma City. I wish to correct a historical error in calling the old adobe building erected by General Vallejo on his original Petaluma grant. "An Old Fort." I am somewhat familiar with the history of that structure since early on 1846. My father's family and myself and wife were kindly tendered the use of the building by General Vallejo on our first arrival in Sonoma. It was the first shelter we obtained and it was then not completed. The carpenters were yet at work on the interior. The late Henry Fowler of Napa and his aged father, William Fowler Sr., were the men or carpenters employed to do the finishing work in the building which was a large square building with a court on the inside (the usual Mexican or Spanish style.) The wide verandas above were some twelve feet in width. The walls on the south and east side were not completed, but were covered with tule to protect them from the rain. The front of the main building had wide verandas, and round to the northwest corner of the building. The building was constructed by General Vallejo for his family residence on his Petaluma Rancho, and had been occupied by them before the General tendered it to our family to winter in. The lower rooms were used for storing grain, hides and other ranch products. Some of General Vallejo's family furniture and other household effects were still in the rooms above, where they were kept for use in the summer when the General and his family came from his town residence to spend the summer months. On our arrival in the night at the ranch, General Vallejo had gone ahead of our worn-out teams. He had his Indian servants prepare supper for our families. The tables were spread with linen table cloths, sperm candles were in the chandeliers, and we had a regular Spanish-cooked repast prepared by his old family Indian cook. The General withen on the table, helping all the large family. After supper was served he handed my wife a large bunch of keys to the various rooms, and assigned one large well finished room to myself and wife, in which our eldest son was born on the 4th day of January, 1847. This was a month or two after our arrival. With a few volunteers I had crossed the Bay to enlist in the war with Mexico. While I was away the General came over from his residence in Sonoma to visit my father and family, and he found another young American emigrant only a week or two old, who had not yet been named. He expressed a desire to see the new arrival and on being shown the youngster, he enquired his name. My mother told him he was not named yet and requested him to name him. He replied, if you give me permission to name him, I will name him for myself--Guadalupe Vallejo Boggs. Everyone consented with pleasure. That young man is now in his 63rd year and lives in Oregon and claims to be the first white boy born under the American flag in California. One or two female children were born in Sutter's Fort probably before or about the same time of year. Mr. Fowler Sr., made a fine redwood cradle for Mrs. Boggs which was a very nice finished piece of carpenter work. The madame expressed her fears as to its durability, the work was so finely executed. The old gentleman said it would last to rock all the children she would have, and it was kept in the family until the baby it was made for grew up and had children of his own and they were also rocked in it. Now, Mr. Editor, I did not intend to bore you or wish to occupy valuable space in your worthy journal, although I claim to be the first man to sign the petition to start the Sonoma Democrata when the blank was presented to me by my old friend, Thomas Thompson. My object was to correct the error that the Petaluma house was an old fort. It is so called on their pictorial post cards, and the press also speaks of it as the "Old Fort." General Vallejo never build but one fort north of the Bay, and that was the barracks in old Sonoma, where the "Bear Flag" was hoisted, commonly called the Quartel, and the General told me that he worked on that with his own hands. By publishing this you will correct an error that has been published time after time. Sutter's Fort and Fort Ross (built by Russians) and the Barracks in the northeast corner of old Sonoma plaza, were the only forts built by the Mexican authorities, except the old Presidio, at San Francisco, and the old barracks at Monterey. Don Salvachons' [sic] now large adobe on the west side of Sonoma Plaza has been called an old fort also, that building was not finished until after we came to Sonoma, and Don Salvachons, the brother of the General built it after we moved to Sonoma from the Petaluma Ranch. A frame addition was added to it on the north side or end facing the street that leads out toward Santa Rosa, and a hotel was made of it and kept by the late Hon. George Pearce and Isaac Randolph, his partner. This building has also been designated as an old fort by ye modern historians. Americans did the carpenter work on both of these buildings after we took the country from Mexico. Although not as well known as some others, one of Sonoma county's most interesting landmarks is the huge adobe ranch house near Petaluma, erected by the late General Vallejo during the days of Mexico's supremacy--"before the Gringos came." This property, together with five acres of land, is to be presented to the city of Petaluma under an agreement whereby the municipality binds itself to care for and preserve the same. Many historic recollections are clustered about the old structure, which for several years has been gradually falling into decay, and it is gratifying to learn that the building is to be preserved as its importance so well warrants. With the expenditure of a little money, the proper amount of taste, and some energy, the old adobe could be made a great show place, serving as still another attraction for tourists and again emphasizing the fact that Sonoma county is one of the most historic portions of the state. Petaluma owes it to the county to do this now that the property is about to come into her possession, and can doubtless be depended upon to discharge her obligation fully and well.